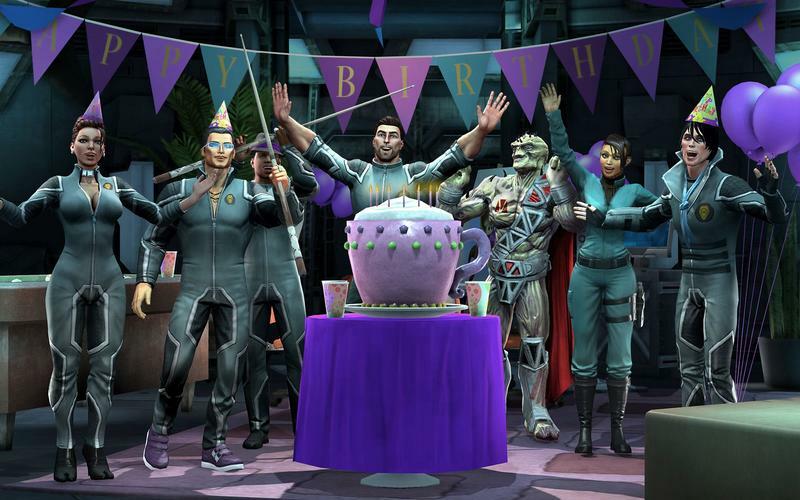 When Saints Row IV launched back in August of 2013, players had to collectively embrace the insanity of the game. The open world romp put players in the shoes of a gangster turned president as an alien onslaught heralded the end of the world. The game finished with Earth destroyed, the aliens defeated and the Saints standing as the last remaining human survivors. Where, exactly, could Volition take Saints Row from there? Hell. They took the Saints to Hell. Saints Row: Gat Out of Hell is a discount expansion of sorts. This $19.99 affair will put players in the shoes of both Johnny Gat and Kinzie Kensington as they travel to Hell in order to rescue the president. Why is the president in Hell? Because Satan wants him to marry his daughter Jezebel. Again. Embrace the insanity or get out. Sure, you're now in Hell and you have the option to play as Gat or Kinzie. Beyond that, friends, this is almost the exact same experience we had in Saints Row IV. In fact, it feels like a reskinned, stripped-down version of the same game. Now, I'm not going to sit here and say that this reskinning is entirely a bad thing. Gat Out of Hell is being offered at a budget price of $19.99. I'm not exactly sure that's the right price for the game, but the starting point discount does afford Volition the liberty of cutting a few design corners. The weapons have changed, there's a new storyline, there are new cutscenes, Steel Port has given way to New Hades and there's even a musical number early on in the experience. Otherwise? The foundation of Gat Out of Hell feels incredibly unsturdy. You're given a directive to save the president during a birthday party for Kinzie. You're dropped into Hell and, essentially, given the greenlight for mayhem. That's just about where the tutorial and direction stops. Cause enough mayhem by recruiting loyalty from the likes of Black Beard and Shakespeare (you'll find out why they're in hell though art-based cutscenes) and you'll have Satan's attention. From there? It's one boss fight to victory. I had the entire campaign and 80 percent of the optional objectives completed in three hours and 30 minutes. It was fun, certainly, but that fun never felt substantial. The key with Saints Row: Gat Out of Hell is that you're only going to get as much mileage out of it as effort you put in. If you go down the direct center of the game while ignoring all the weapon and power upgrades, you're going to have a terrible time. If you enjoy the side quests, like flying around the world and have fun upgrading the seven deadly sin based weaponry, Saints Row: Gat Out of Hell will be fun. Again, I'm not sure if it's $20 worth of fun, but there's enjoyment to be had. It's just that the main line of the campaign really isn't all that interesting. Unlike Saints Row IV before it, there really aren't any campaign-based quests that break the fourth wall in interesting ways. The jokes fall flat here, the novelty has disappeared and you'll complete the story simply because it's the next item on your objective list. If you're okay with those facts and you don't mind an experience that requires the player to go the extra mile to eek out fun, Saints Row: Gat Out of Hell is an enjoyable experience. If, however, you want the campaign to be the good stuff, you'll be sorely disappointed. As I've mentioned several times over in this brief review of a short game, the entire value of Saints Row: Gat Out of Hell depends upon what you're willing to pay for the game. Speaking personally, I don't know if I'd be satisfied with the experience for $19.99. I will likely have the game 100 percent complete in four hours and 30 minutes. That's a bit too tiny for $20. Now, if you've never played Saints Row IV, you can get the game bundled with Gat Out of Hell for the PC, PlayStation 4 or Xbox One in the Re-elected edition. That package is selling new for $49.99, and I totally see the value of that as solid. I loved my time with Saints Row IV, and getting that game and this expansion on a new generation platform for $50 in order to play it for the first time would be a win. For gamers who have already played the pants off of Saints Row IV, I don't think $19.99 is a good price for this expansion. Were it $10 or $15, I don't think I'd hesitate. That five bucks, though? It's an odd difference maker. If you're a diehard Saints fan, I say go for Gat Out of Hell at $19.99. If you're a new console owner who has never played Saints Row IV, snap up the bundle for $49.99. For everyone else? Wait for a sale. Gat Out of Hell is a good time, no doubt about that, but it's a brief experience that's priced a smidgen too high alone. Disclaimer: We received a code to download and review Saints Row: Gat Out of Hell for both the PlayStation 4 and Xbox One. We played the game on both consoles, but we beat it on the Xbox One first.